Lessons from Copenhagen on Bicycling. Here is an article from Streetsblog San Francisco about the lessons that can be learned from a recent conference that was held in Copenhagen. In the city of Copenhagen 37% of the trips to work and school are made by bicycle. Below is the FrontRunner South construction update for June 26 – July 2. Please visit UTA’s FrontRunner South Webpage to learn more about the project. UTA is currently testing its new low-floor light rail vehicles on a test track near Daybreak in South Jordan. The 77 new vehicles will be used on the new TRAX lines being constructed as part of the FrontLines 2015 program, and could be carrying passengers as early as next year. Visit www.flickr.com/rideuta to view exclusive FrontRunner South construction photos and photos from UTA’s recent new light rail vehicle inaugural ride event. Crews will pour concrete for the south abutment and the bridge piling and erect pier shoring at the 3300 South bridge. Work on the wrap-around wall at the 3300 South bridge will also resume. Crews will build a crane pad, mobilize a crane, and deliver sheet pile shoring to the 4500 South Frontage Road in preparation for construction of the south abutment of the 4500 South bridge. Crossing upgrades at the 4800 South crossing will finish this week, and at the 5300 South bridge, crews will work on two of the bridge piers. The eastbound right lane on 4500 South will be closed on Wednesday. The 4500 South Frontage Road will be closed at the tracks for bridge work from June 28 through the end of August. There will be shoulder work with a flagger at the 4800 South crossing on Monday. Crews will be excavating at the station site this week to prepare for upcoming concrete pours. Continuing this week is storm drain work between Wasatch Street and 9000 South and wall construction between 9120 South and 9400 South. Crews will mobilize a crane to 9120 South to prepare to construct a bridge over that road. Crews will install permanent fencing near the flyover bridge, construct a wall just south of 10000 South and work on a waterline at 10200 South crews. Just south of 10600 South crews will excavate for a retaining wall, and from Jordan Gateway to 11400 South, crews will continue to excavate the grade and begin mass embankment. At 114th South crews will excavate in the roadway and install drainage. Crews will continue to locate and place protection for utilities near the site of a retaining wall that will be built between 11400 South and 12300 South. They will also place cross drains and sub ballast in the area. At the Bangerter Highway bridge, crews will excavate to prepare for construction of a wrap-around wall. There will be truck traffic with flaggers on 9400 South and 10800 South Monday through Friday. Lightweight fill for the job is being stored at the station site. Crews continue to excavate the slope below the Thanksgiving Point golf course. At the 2300 West bridge crews will pound H-pile for the south abutment and form the north abutment and pour concrete for a wing wall. At the 2100 North bridge crews will work on the deck overhangs, ballast walls, diaphragms, and the deck rebar. Mass embankment will take place between 2100 North and 1500 North and crews will relocate power poles between 900 North and 500 West. There will be truck traffic on Garden Drive near the pedestrian tunnel Monday through Friday. On 1500 North there will be truck traffic with flaggers Wednesday through Friday. Work on the pedestrian this week includes forming the stair grade, forming and pouring concrete for the stairs sub-base and middle wall, building wall forms, forming a culvert and the tunnel floor and setting drains. Between the American Fork Station site and 200 South, crews will continue to install barb wire fencing and embank the grade and also construct a track turnout. Crossing upgrades will finish this week at the Storrs Avenue crossing. Crews will continue to de-stress the track between 100 West and 100 East crews and construct a retention pond near the 1100 South crossing. At the American Fork River bridge crews will install an emergency guard rail and at the 1500 South crossing crews will install sidewalks. Waterline work will also continue on 1100 South. In Orem, duct bank tie-in work will continue at 400 South and bottom ballast will be placed between 800 South and University Parkway. On Storrs Avenue in American Fork there will be a lane drop with flaggers Monday through Wednesday. Union Pacific will be working near the 100 East crossing in American Fork Monday and Tuesday; there will be a lane drop. The road will be closed near the 1100 South crossing in American Fork for utility work all week. There will be truck traffic with flaggers on 1500 South in American Fork Wednesday through Friday. Crews will continue wall construction and landscaping at the Park and Ride Lot as well as set a box and pull wire for an irrigation timer. Crews will pour concrete for the west deck. Between University Parkway in Orem and 2000 North in Provo, crews will continue to distribute rail, surface, line and dress the track, and begin to place ties and construct track for the second line. Mass excavation of the grade will continue between University Avenue and 900 South. Crews will continue to form and tie rebar for the vapor barrier and place snowmelt facilities on the platform deck at the station this week. Crews are currently excavating the east side of 3700 West from the US Post Office to 400 North. After sidewalk and driveway is restored, crews will continue north towards 510 North with similar activities. Lane restrictions will be in place; however, access will be maintained. Crews are working on walls and excavating the guideway between the X Bar Bridge and 3700 West. · Crews will be crossing Terminal Drive with utility work in the upcoming weeks. More details will follow as we get closer to this work. Work at the North Surplus Canal is now complete. Now that girders are in place, crews have begun deck work at South Surplus Canal. This work will continue for the next two weeks. Crews are working on wet and dry utilities. Lock and load walls are being installed throughout this reach. Curb, gutter, sidewalk, and wet and dry utility work continues to make its way west. Crews are nstalling a signal conduit at 2200 West. Crews have begun removing a portion of the island between North Temple and Old North Temple. Lane restrictions are in place; however, access to Old North Temple will be maintained. Beginning the first week of July crews will begin work at 2200 West and North Temple. As we get closer to construction we will meet with businesses in this area. Beginning Sunday, June 27, crews will be working nights to relocate a joint trench. This work will take place from 7 p.m. to 7 a.m. for approximately two weeks. Noise is expected to be minimal as louder activities will take place during the day. Beginning early next week crews will be removing and replacing curbs, gutters, sidewalks and driveways on the south side of North Temple between Redwood Road and 1950 West. Crews are relocating utilities on the south side of North Temple between Redwood Road and 1950 West. There will be lane restrictions, but access to all businesses will be maintained and signage will be provided. In approximately two weeks, crews will begin sewer sag repairs at Orange Street and North Temple. Various lane restrictions will be in place; however, access to businesses will be maintained and signage will be provided. As we get closer to construction we will be meeting with businesses in this area. Crews will begin relocating hydrants and water services in the upcoming weeks. As we get closer to this work we will meet with businesses and coordinate any planned interruptions to services. Work continues on the south side of the Jordan River Bridge as crews work on the bridge deck. The Jordan River Bridge is still on schedule to be completed before the Utah State Fair begins in September. Crews are installing a storm drain on the south side of the Jordan River Bridge. There is occasional potholing for dry utilities taking place ahead of heavier construction. No work is taking place in this reach. Crews will begin relocating City Creek West from the Jordan River Bridge to 1000 West late July. On July 10 North Temple will be closed from 600 West to 700 West for the Mestizo’s West Side Art’s Festival. Traffic Impacts: Traffic management is in place near the Jordan River Bridge and is limited to one lane in each direction. The North Temple Viaduct re-construction project has begun and will last approximately 18 months. Crews are now nearing completion of the demoltion portion of the work. In approximately one week, crews will start drilling 16 drill shafts for the new viaduct. This work will take place for approximately three weeks and noise is expected to be minimal. Crews are potholing on 400 West to prepare for utility relocations. · Night work is taking place near the 3100 South and Constitution Boulevard intersection. This work is scheduled to last until June 12 as crews work on an electrical communication system. Noise is anticipated to be minimal. · Crews will begin installing station canopies and benches during the first few weeks of June. Traffic Impacts: There are lane restrictions along Constitution Boulevard; however, access is being maintained. · Crews are currently working on curbs and sidewalks near the E Center. · Landscaping is scheduled to take place in planter islands toward the end of June. · Decker Lake Drive is now open. We appreciate businesses for their patience during this work. · Research way will close at Redwood Road on June 29-30. During this time traffic will be detoured to Decker Lake Drive and 3100 South. · Decker Lake Drive is expected to be reopened to north/south traffic next week. Reach Description: Reach 5 includes construction along 1070 West in the Chesterfield industrial area. This reach includea one bridge structure over the Jordan River and another over 900 West. · Crews are excavating the east side of 1070 West. This work will include new curbs, gutters, sidewalks, and driveways. Access to all businesses will be maintained. · We thank businesses in this area for their patience during construction. Reach Description: Reach 6 runs through the Union Pacific Railroad’s Roper Yard area. Although there are no businesses and residents, extensive coordination will take place to ensure that train travel is maintained. Reach 6 includes plans for an extensive bridging system that will enable TRAX to operate over other train traffic. Reach Description: Reach 7 is the area where the West Valley Line will connect with the current north/south TRAX Line. Construction is taking place along Andy Avenue in South Salt Lake. Crews will closely coordinate activities with businesses to ensure access is maintained. · Crews are scheduled to distribute ties and rail toward the last part of June between 300 West and 600 West. 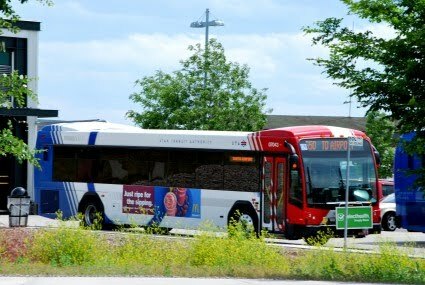 · 300 West at Andy Avenue is scheduled to temporarily close for TRAX construction beginning at 9 p.m. on Friday, June 25, until 5 a.m. on Monday, June 28. Crews will be installing the tracks across 300 West. This temporary closure is scheduled during the weekend and nights to minimize impacts to the traveling public. We will meet with businesses to talk about detours to be implemented during this closure. * 2700 West will be closed between Sugar Factory Road and Spaulding Lane from Wednesday, June 30th through Friday, July 2. It will reopen on Saturday, July 3. * Sugar Factory Road will be closed at 2700 West from Wednesday, June 30th through Friday, July 2. It will reopen on Saturday, July 3. Concrete work continues at station platforms in Daybreak. Crews are also testing the new light rail vehicles in this segment. Crews continue finishing concrete work on the 4800 West station platform. The sound berm extension on the west side of Wasatch Meadows has been rescheduled for this week. Crews will also be working to repair the drainage channel west of 4800 West. Concrete work continues at the Bangerter and 2700 West station platforms – the canopies have been erected at Bangerter, and will soon be installed at 2700 West as well. OCS work progresses as well, as nearly all poles have been installed and wire is being hung. * NEW ACTIVITY: Asphalt paving at the 2700 West railroad crossing. through Friday, July 2. Sugar Factory Road will be closed at 2700 West during this time. The Jordan River Parkway Trail is now open. Work has now begun to shape the embankment just south of 7800 South. Workers continue installing OCS foundations between the Jordan River and Bingham Junction station. Grading at the Gardner Village park & ride lot and concrete work at the station platform are both scheduled for this week. 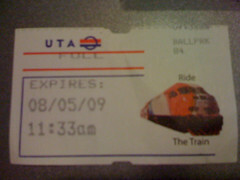 Yesterday I had a few hours to kill so I naturally decided to spend some time riding TRAX and some UTA buses. First of all I started by walking to the Meadowbrook TRAX station from the area around 4000 South and State. A few days ago I made some comments about the new development going in south of 3900 South and I pointed out some of the problems current facing the complex. Well I discovered another one. There is no sidewalk currently on the south side of 3900 South from West Temple to Main. In fact the southwest corner of Main and 3900 is a death trap. There is no way for cars trying to turn right onto Main or even going straight to see a pedestrian that is trying to cross the street from that point. I did it and lived to tell about it but this is another reason that I do not see that new development being a true TOD development. Once I got to the station I decided to take the first train that came along and that was a University to Sandy train with two of the ex-San Jose UTDC/Bombardier light rail vehicles. The car I rode in was squeaking really bad but hopefully these will be replaced by the new S70 cars next year. I didn't mention it in my article on TOD but the new development at the former Smith's store at 7800 South and State is another example of TAD. It is playing on the fact that it is near a TRAX station but the development is clearly auto centric and because of the lack of amenities nearby (except of an excellent burger joint and a couple of restaurants) will do nothing to decrease car trips. After arriving at the Sandy Civic Center Station the train went out of service and since the only bus in sight was the 811 and I didn't feel like heading to Utah County, I hopped the northbound train to Central Station. The new TRAX Express concession building is nearly complete at the Sandy Civic Center Station. Hopefully this will prove to be a success since so many TRAX stations are far conveniences. I also noted that there has been a lot of progress in the last couple of weeks at the 6200 South TRAX station where the new Mid Jordan line will tie in with the existing line. I also noted that the turnouts for the West Valley line have been put in. I took TRAX all the way to central station and decided to walk over to the bus area and catch the first bus that came along. The first thing I have noticed is that a shelter has been installed over the bus boarding area. Not a real bus shelter but one of those canvas shelters used when camping and for outdoor parties and such. I am sure that bus riders will not mind having some shade from the hot summer days. The first bus boarding as I approached the bus area was a 217 but there was a large number of people getting on so I waited for the bus behind it which was the 240 and jumped on it. This is the first time that I had the chance to ride this route since it was created during the bus realignment. There was no one on board as we left central station and only person other person boarded before we jumped on the freeway and headed to Redwood Road. By the time the bus turned onto Decker Lake Blvd the driver was running a couple of minutes early so we sat and waited for time. We were riding in one of the oldest buses currently in the UTA fleet, a 1997 Gillig Phantom. While the bus may be older, it still is holding up better than the low floor buses that will soon replace this one. 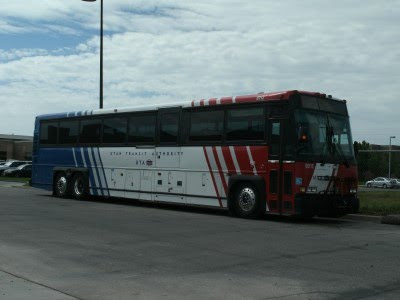 In fact, once the 1996 and 1997 Gillig Phantoms are retired UTA will basically have an all low floor bus fleet except for the MCI Commuter Cruisers. While I know low floor buses make it easier for people with disabilities get on and off, I still dislike how much seating capacity goes down with a low floor and the quality just doesn't seem to stack up. I decided since I had not had the opportunity to ride MAX since the bus lanes open I would give it a shot. The other person on the bus got off along 3100 South giving me a bus to myself for a few blocks. However, that would not have lasted long if I didn't get off at 3500 South since there was a fairly good crowd getting on when I disembarked. I walked over to the MAX stop and waited for the bus to come. After about a 8 minute wait I boarded Van Hool bus number 09104 with a couple of other passengers. With the lack of seating capacity on the Van Hool's it doesn't take much of a crowd to fill up the seating capacity but I had no problem finding a seat on the left had side of the bus. After crossing Bangerter Highway the bus enters the new bus lanes. While the lanes made have saved a couple of minutes, all the time saved was loss as the bus had to wait in an attempt to cross the road in order to turn right onto 2700 West. After making a loop pass the future TRAX station we headed toward to Millcreek TRAX station. I once again boarded the first TRAX came that came along which was once again heading toward downtown. I was getting hungry at this point so I decided to head to the City Creek Center's Food Court and see what was available there. Among the choices were: Red Iguana, Bocata, Sbarro, Suki Hana, Great Steak, Chang Chun, and McDonald's. Soon there will also abe a Roxberry's and Subway. Except for the Red Iguana its pretty much standard sub par mall offerings but I was in the mood for Chinese so I tried Chang Chun. The food was good and the price reasonable so I can't complain. I then boarded a TRAX train back to 3900 South that ended my journey for the day. Today I also took a shorter trip in order to head to a function I had to attended at 6:00pm so I rode the 213 and caught a northbound TRAX train. There was a fairly good load on the 213 with a number of people getting on and off along the way. In fact I believe we stopped at every single stop along the 1000 east stretch of the route. You have to wonder if BRT is started along 1300 East how much the 213 would be cut back and how it would affect service along the route. 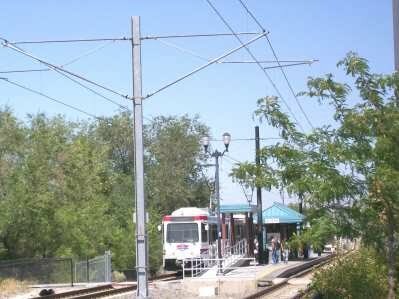 I then rode TRAX to the Murray Central TRAX station. The car I rode in seemed to have a flat spotted wheel as it had a distinct thumb while moving. I had to walk to Vine then over to 300 West then south toward 5300 South to reach my destination. As I have pointed out in the past, Murray has done little to connect both sides of the tracks so to speak in this area. You have the new developments on the east side including the IHC Death Star as many people call it which was poorly designed to and doesn't integrate well with the TRAX station. Then you have the 300 West corridor on the far side of the UP and future Front Runner tracks that have not been given easy access to the TRAX station. Hopefully as the station becomes an even more important transportation hub with the addition of Front Runner South, Murray will see fit to blend the areas together and make access easier. I also wanted to give you a heads up on some article ideas I am working on. I will guarantee how fast each individual article will be put on the blog but keep an eye out. Why the streetcar may be downtown Bountiful's only hope. So there is a preview of future articles plus several others I have on the burner. PUBLIC NOTICE is hereby given of the regular meeting of the Board of Trustees of the Utah Transit Authority at 2:30 p.m. on Wednesday, June 23, 2010, in the Golden Spike Rooms at the Frontline Headquarters Building located at 669 West 200 South Salt Lake City, Utah, with the following agenda. 3. Resolution of the Board of Trustees of the Utah Transit Authority Authorizing Fiscal Year 2010 Modification to 457 Deferred Compensation Plan. 11. Action Taken Regarding Matters Discussed in Closed Session. a. Chair/Vice Chair Election, Time Certain 4:00 p.m.
a. Approval of Financial Statements of April 30, 2010.
b. Approval of Minutes of Board Meeting of May 26, 2010. NOTE: Some Board Members will participate via telephone. Below is the FrontRunner South construction update for June 19 – 25. Please visit UTA’s FrontRunner South Webpage to learn more about the project. At the 3300 South bridge, crews will work on a pier collar and one of the abutments. They will also be placing panels for the wrap-around walls at the bridge and backfilling them. At the 4500 South bridge, crews will finish excavation for the north abutment and drive H-pile. On 3300 South the eastbound left lane and westbound right lane will be closed Monday through Thursday. The crossing upgrade work scheduled for last week at the 4800 South crossing was rescheduled for this week due to flooding. Upgrades include signal and track work, the installation of concrete medians and signs, road striping, and asphalt replacement. At the 5300 South bridge crews will continue work on a cheek wall and at the 7200 South bridge crews will continue to install slope paving. The 4800 South crossing will be closed from Monday, June 14 through Sunday, June 20. On 5300 South the right lanes eastbound and westbound will be closed on Monday. The westbound right lane will also be closed Tuesday through Thursday. Crews will continue backfilling at the Murray Station platform. Storm drain work continues between Wasatch Street and 9000 South and wall construction will resume between 9120 South and 9400 South. At the flyover bridge, crews will place surcharge on the north side of the bridge, and at 10000 South, crews will continue storm drain and water line work. Just south of 10000 South, crews will be excavating and pouring a leveling pad for a retaining wall. At 10600 South crews will be drilling a shaft for the bridge Saturday night through Monday morning. They will also be relocating a utility pedestal and installing conduit and fiber infrastructure near the bridge. Between 10600 South and Jordan Gateway, crews will be installing temporary fencing, clearing and grubbing the corridor and excavating for a wall. From Jordan Gateway to 11400 South, crews will install irrigation boxes, storm drain and also excavate the grade. Between 11400 South and 12300 South, crews will locate and place protection for utilities in the area of a wall that will run behind Clintwood Dr. They will also be installing field fence, excavating and embanking the grade, and installing an irrigation siphon in the area. At the Bangerter Highway bridge, crews will continue work on one of the piers. There will be a lane closure on 10000 South Monday through Wednesday; there will be flaggers directing traffic. On 10600 South, all westbound lanes and one or two eastbound left lanes will be closed from Saturday, June 12, at 8:00 p.m. until Monday, June 14, at 5:00 a.m.
On Bangerter Highway the two westbound left lanes and the eastbound left lane will be closed on Monday and Tuesday. Crews will begin excavation of the slope below the Thanksgiving Point golf course. Crews will be demolishing track at Union Pacific’s Mesa Siding. At the 2300 West bridge crews will work on one of the abutment’s wing walls and at the 2100 North bridge crews will set the final bridge girders and work on the bridge deck. At 1500 North, crews will install a duct bank tie-in, and between 900 North and 500 West, crews will excavate for a ditch, finish slopes, prepare the sub grade, remove surcharge and place sub ballast. Between 200 South and 300 South crews will continue constructing a minor wall. There will be truck traffic with flaggers on Garden Drive near the golf course Monday through Friday. Work on the pedestrian tunnel footings and ramp and stairs will continue this week. Crews will also be excavating for a detention pond near the station site. In American Fork, between the American Fork Station site and 200 South, crews will install barb wire fencing, place ballast mat and stage ties. Crews will also place ballast mat between 200 South and Storrs Avenue. Construction on a retention pond near the 1100 South crossing and road realignment work near the 1500 South crossing will continue. In Vineyard, track boxes will be installed between 5200 North and 400 North, and in Orem duct bank tie-ins will be installed at 400 South. Crews will place bottom ballast on the ballast mat and place ties and construct track between 400 South and 800 South. Fencing work will continue at the soil nail wall constructed near University Parkway. There will be truck traffic with flaggers on 1100 South in American Fork on Monday. In American Fork, 500 East will be closed near 1100 South Tuesday through Sunday. In Orem there will be truck traffic with flaggers on 800 South Monday and Tuesday. At the Park and Ride Lot crews will work on a wall, wash concrete and stripe the parking lot, and continue installing landscaping. Crews will continue to work on snowmelt facilities as well as place vapor barrier and rebar. Between University Parkway in Orem and 2000 North in Provo, crews will place sub ballast and bottom ballast. Between 2000 North and 1680 North crews will surface, line and dress the track and between 1680 North and 820 North crews will de-stress the track. Permanent fence will be installed between 500 West and Freedom Boulevard and mass excavation and stabilization work will take place from Freedom Boulevard to University Avenue. South of University Avenue crews will install a Union Pacific signal communications line. There will be truck traffic on Freedom Boulevard in Provo Monday through Friday. UTA thanks everyone who attended the unveiling of its new light rail vehicles this morning. Construction of the Mid-Jordan TRAX extension is moving forward, and the line should be operational by late 2011. * 5200 West will be closed at the railroad crossing on Saturday, June 19th from 7 am to 5 pm. * The Jordan River Parkway Trail will reopen June 22. Crews are also repaving the railroad crossing at 5200 West, and finishing concrete work on the 4800 West station platform. Overhead catenary system (OCS) poles are being erected and arms are being installed near 4000 West. * NEW ACTIVITY: Installation of new asphalt pavement at the railroad crossing on 5200 West. TRAFFIC IMPACT: 5200 West will be closed Saturday, June 19 between 7 am and 5 pm. Construction of the Redwood Road rail crossing is complete, and crews have nearly finished installing concrete medians and sidewalks. Concrete work is moving forward at the Bangerter and 2700 West station platforms. Crews are also working to complete track work in this segment. The Jordan River Parkway Trail will reopen Tuesday, June 22 as crews have nearly completed widening the embankment of the rail right-of-way between 7800 South and the Jordan River. Work has now begun to shape the embankment just south of 7800 South. Workers continue installing OCS foundations between the Jordan River and Bingham Junction station. * ACTIVITY: Embankment work between the Jordan River and 7800 South. TRAFFIC IMPACT: The Jordan River Parkway Trail will be closed from 7800 South to the Jordan River through Tuesday, June 22. Construction progress continues on the West Valley TRAX Line. To keep business and traffic impacts to a minimum, this five-mile project has been separated into seven construction “reaches,” or segments, for management and planning purposes. The map below shows each construction reach in a different color, starting with Reach 1 in light green on the south end of the project and ending with Reach 7 in dark green on the north end. · Night work is taking place near the 3100 South and Constitution Boulevard intersection as crews work on an electrical communication system. Noise is anticipated to be minimal. Traffic Impacts: There are lane restrictions along Constitution Boulevard; however, access is being maintained throughout the area. Reach Description: Reach 2 is the area along 3100 South from Constitution Boulevard to Decker Lake Drive. The E Center and a few other businesses are located in this reach, as well as residents. Access will be maintained and we will coordinate with the E Center so you can continue to visit the great events they have to offer. When TRAX is completed along 3100 South, it will operate on the south side of the roadway. · Progress continues the northern portion of Decker Lake Drive just south of Research Way. This temporary closure is anticipated to last until the first part of June. Access will be maintained. We thank businesses for their support and patience during construction. Please see map for detour information. · We thank businesses for their patience during construction. · Progress continues on the TRAX bridge structures over 900 West at approximately 2200 South and at the Union Pacific Railroad Roper Yard area. 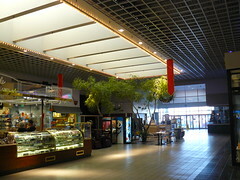 · Work is taking place on the overhead electric system. · 300 West at Andy Avenue is scheduled for temporary closure beginning at 9 p.m. on Friday, June 25, until 5 a.m. on Monday, June 28 as crews install tracks across 300 West. This closure is scheduled during the weekend and nights to minimize impacts to the traveling public. We will meet with businesses to talk about detours during this closure. Crews are currently excavating the east side of 3700 West from the United States Post Office to 400 North. After sidewalks and driveways are restored, crews will continue north toward 510 North with similar activities. During this time, lane restrictions will be in place; however, access will be maintained. Crews are currently working on wet and dry utility work. Lock and load walls are being installed. Crews have begun removing a portion of the island between North Temple and Old North Temple. Lane restrictions will take place; however, access will be maintained. Crews are currently relocating utilities and reconstructing driveways on the south side of North Temple between Redwood Road and 1950 West. During this work there will be lane restrictions but access to all businesses will be maintained and signage will be provided. In approximately two weeks, crews will begin sewer sag repairs at Orange Street and North Temple. At this time, various lane restrictions will be in place; however, access to businesses will be maintained and signage will be provided. As we get closer to construction we will meet with businesses in this area. Beginning the first week of July crews will be removing and replacing curb, gutter, sidewalk and driveways on the south side of North Temple between Redwood Road and 1950 West. Crews will begin relocating hydrants and water services in the coming weeks. As we get closer to this work we will meet with businesses and coordinate any planned interruptions to services. Work continues on the south side of the Jordan River Bridge as crews begin working on the bridge deck. The Jordan River Bridge is still on schedule to be completed before the Utah State Fair begins in September. No work is currently taking place in this reach. Crews will begin relocating City Creek West from the Jordan River Bridge to 1000 West from early July to late August. Reach Description: Reach 7 is the area where the Airport Line will connect with the current north/south TRAX Line at the Arena Station. This reach extends from I-15 to 400 West along North Temple and turns south on 400 West to South Temple. Access to offices and the Gateway will be maintained throughout construction. The North Temple Viaduct re-construction project began in April and will last for approximately 18 months. Crews are now nearing completion of the demoltion portion of the work. Crews are currently working on a gas line at 300 West. This work is being done underground with a boring machine and will not require any driveway closures. In approximately two weeks, crews will start drilling 16 drill shafts for the new North Temple Viaduct. This work will take place for approximately three weeks and noise is expected to be minimal. No night work is scheduled for the viaduct; however, if Union Pacific Railroad grants approval for night work we will notify all residents and businesses in the area as soon as possible. Please see the viaduct construction guide attached below to find out how to get around during construction. PUBLIC NOTICE is hereby given of the regular meeting of the Board of Trustees of the Utah Transit Authority at 2:30 p.m. on Wednesday, June 23, 2010, in the Golden Spike Rooms at the Frontline Headquarters Building located at 669 West 200 South, Salt Lake City, Utah, with the following agenda.